Three hours spent 39,000 feet above sea level and two cups of coffee later, I am finally in the paradise I call home. Yes I am here in the beautiful Fiji Islands to celebrate Fiji Day. So why am I telling you all this? Because I know that you can take the little girl out of Fiji but you cannot take Fiji away from the little girl. Growing up in New Zealand I was fortunate enough to travel back to Fiji at least twice a year, and for me a feeling that I will always treasure is landing in Fiji, walking out of the plane and feeling the warmth that envelops you. For me this feeling is coupled with a sigh of relief, I am home once again. Being a Fijian who has lived most of my life in New Zealand you may think that Fiji is no longer my home. But in actual fact not having the opportunity to grow up in the friendly island paradise only makes me realise how much I may have missed out on. As they say, distance makes the heart grow fonder. That is why this year on October 8, I jumped on a plane and made my way from Auckland to Suva, not only to pay my respects to my homeland but to also celebrate the auspicious occasion in true Fijian style with my loved ones. Before I tell you how I spent Fiji Day let me share some of the stories I have grown up on as a child about this special day. My mother vividly recalls the day Fiji became independent from the British on October 10, 1970. She grew up in Suva and was a student at Duddley Intermediate School at that time. It was a festive time and all the local schools were part of the official programme at Albert Park. She remembers having to dress up as an indentured lady wearing a long skirt and a veil to cover her face. Each group of students was told to dress up to represent the different groups of people who came to Fiji. They included; the Chinese, the Europeans, the Indentured Indians and of course the people of the land, the iTaukei. As many of you will recall, she says it was a festive time and extremely exciting for all the children she knew. Students were given soft drinks, sweets and flags and the whole country was in a festive mood. Indeed, it was a historic moment that she feels grateful to have been a part of. For my mum and her family the festivities didn’t just stop in 1970, they continued to annually celebrate with a special family dinner of local seafood, Lovo and BBQ’s as I am sure many Fijians continue to do till today. Going to the Suva Point beach or Albert Park were some of the highlights of the special day. My father who was older and attending Nadi Muslim Collage at the time of Independence had a slightly different perspective of the day. For him the experience was about much more than just the festivities. He recalls attending a function at Prince Charles Park in Nadi where the atmosphere was filled with a sense of freedom. It was freedom from being governed by the British and essentially being governed by people who did not understand many of the struggles and tribulations that we as Fijians were going through. 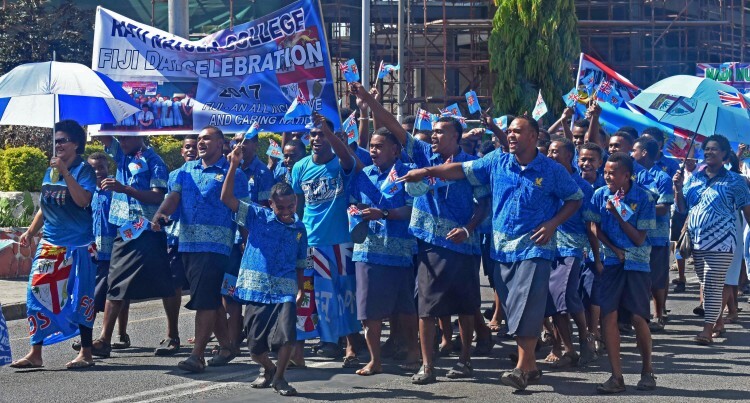 Being older and towards the end of his high school, my father says he was able to witness and understand the changes that Fiji’s Independence brought with it. Prior to Fiji’s Independence all the top positions in Fiji were held by the British but after Independence, opportunities for local people to showcase their abilities, knowledge and skills opened up. To him it truly changed the way he viewed himself as an equal citizen of the country (of course it all didn’t happen overnight but the Independence was the starting point to change). My father came from a small community called Sabeto and the tradition at their house was to celebrate Fiji Day with a family gathering and a delicious meal of Palau for dinner. Fiji’s Independence is a part of my history and is the catalyst to many opportunities in my life. I was born in 1983 much after the Independence had already taken place but it is still a day of celebration for me personally. To me it symbolises the freedom of my people. The freedom of my family and in particular my parents. It represents all the opportunities that have followed on from the day for me and for our future generations. It is a day that brings all of us together as Fijians to celebrate the fact that we are in control of our homeland regardless of where our ancestors came from. We are all Fijian and that is something I am truly proud of. All that said the only thing left to share is why have I come to Fiji to celebrate Fiji Day? It is simple, I wanted to be in my homeland and enjoy the food, festivities and family that I have been blessed with by being a true Fijian. Although Fiji is always in my heart there is nothing quite equal to spending time where one feels at home. So as you can see it doesn’t matter what you did or didn’t do to celebrate Fiji Day. The important thing is to always remember that it’s our people, our communities and our loved ones that really make any festive occasion special. Thank you Fiji for welcoming me back home with open arms and allowing me to join you in celebrating our freedom together.